From 1994 to 2003, Shed Seven enjoyed 15 consecutive Top 40 hits. However, since re-forming ten years ago, they have not released any new music, despite regularly playing to thousands of fans at festivals and on their own headline tours. This changes, of course, with the release of their fifth album Instant Pleasures, (their first since 2001’s Truth Be Told), which sees them enlist the considerable production skills of former Killing Joke bassist Youth. Comeback single ‘Room In My House’ is also the opening track on the new record, an old school Sheds anthem somewhat in the vein of ‘She Left Me On Friday’. It’s clear from the off that this isn’t going to be a low-key return, and ‘Nothing To Live Down’ follows hot on its heels, a distant cousin perhaps of Maximo Park‘s ‘Going Missing’; the two up-tempo tracks make for a confident reintroduction to the band. 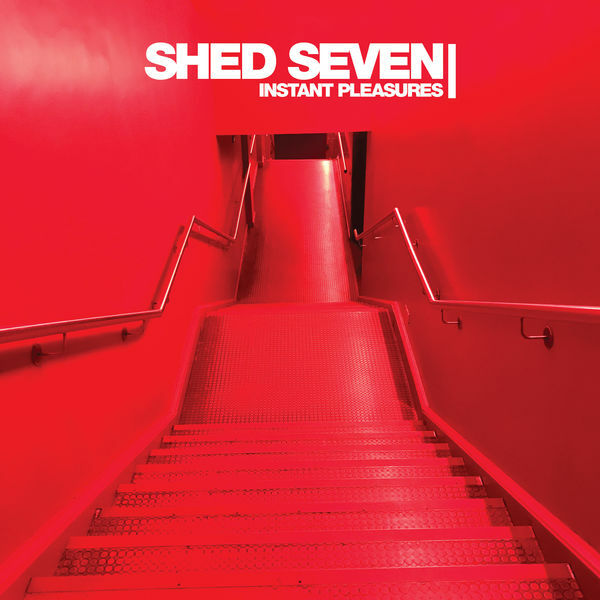 Through the album, it’s the classic Shed Seven sound all the way, but with probably the biggest-sounding production that the band have used so far. Backing singers, brass and strings are used, though not over-used, and the whole thing sounds huge. In a good way. Any of the twelve tracks could follow ‘Room In My House’ to heavy 6Music rotation (maybe Radio 2 too these days? ), with perhaps the most obvious candidates being ‘Said I’m Sorry’ and ‘Enemies and Friends’. The reflective ‘Better Days’ begins with mournful piano and adds swooping strings to the mix, while singer Rick Witter turns in one of his best ever vocals. It’s another lighters-in-the-air anthem in the making, while ‘Star-Crossed Lovers’ puts a winning guitar riff up-front, adds a Motown beat and another massive chorus. Far from being a front-loaded album though, the (potential) hits keep on coming, indeed three of the best tracks are the final three on the record: ‘Butterfly On A Wheel’ isn’t a Mission cover, but a classic Shed Seven stomper, while ‘People Talk’ recalls the glossy groove of fan favourite ‘Disco Down’ and closer ‘Invincible’ could well be the band’s new ‘Chasing Rainbows‘-sized singalong. It is easy to imagine thousands of men and women of a certain age belting it out at the upcoming ‘Shedcember’ tour, which is actually the band’s biggest U.K. tour to date. Those writing off the band, and let’s face it there are quite a few, are missing out (to quote an early album track) on a shedful (sorry!) of really good songs delivered with the self-deprecating charm of the genuinely funny Rick Witter, who is one of the most charismatic front-people out there. His voice has lost absolutely nothing in the intervening years, if anything, he sounds more energised than ever. The band have taken their time in maybe assessing the demand for a new record, and have clearly exercised tight quality control in assembling an album that will be exactly what long-time fans have been waiting for. Instant Pleasures is released in BMG on 10th November 2017.